Lisa Thorpe-Vaughn, executive director of Amachi Pittsburgh at the Pittsburgh Leadership Foundation (PLF), knows from first-hand experience the benefits of mentoring children of incarcerated parents. 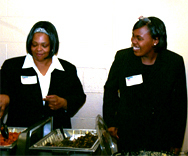 For seven years, Thorpe-Vaughn has been mentoring her now 21-year-old mentee, whose father was incarcerated. “It’s unbelievable,” said Thorpe-Vaughn. “I thought she would have never made it. The fact that she made it out of high school was significant enough for me.” At one point, Thorpe-Vaughn spent a whole year trying to get her mentee back in school. She had been expelled for fighting from every school she attended. Thankfully, the hard work paid off. Today the mentee is serving as a mentor herself, is a VISTA worker for the Amachi program and is enrolled in ministry school through her church. “To really see her giving back because someone stopped and gave her some time makes this all worthwhile,” said Thorpe-Vaughn. PLF began the Pittsburgh Amachi program in October 2003, an endeavor that was not without challenges, given the sophisticated partnership it entailed. PLF has fiscal responsibility for the Pittsburgh Amachi program and is responsible for finding the children and volunteers. Two of their partners, Mentoring Partnership of Southwest Pennsylvania and Family Guidance, are responsible for screening, matching, mentor training and case management. The University of Pittsburgh Office of Child Development is responsible for monitoring and evaluating the program. MANY provides grant and program consulting to PLF. Angel Tree and Allegheny County Jail assist with finding the children. And of course the church partners provide the volunteers. You have to “be careful and very clear with your partners on roles and expectations,” said Thorpe-Vaughn. “A lot of people come to the table with different agendas and you want to make sure that you stay focused. Sometimes even now I just hand out the roles and responsibilities of the partners all over again just to remind us all of what we said we would do,” she added. Thorpe-Vaughn has found children through caregivers while visiting area hair salons. Additionally, she facilitated a summer concert where she recruited children through the radio station giveaways. “It’s really based on relationships,” she said. “If people know you and know something about you, then they give you the information. So the more we publicize and the more we actually get out in the community, we’re finding that it’s much easier talking one-on-one to caregivers and parents.” PLF’s rate of referrals for children has increased by 65 percent since implementing these nontraditional recruiting methods.